Nowadays, many families are opting to buy a trampoline to use in their own back yard. Furthermore, rebounding is a form of exercise that has become wildly popular, and there are a wide variety of brands and types of rebounder currently on the market. A brand that has caught our attention recently is Ancheer, who manufacture a variety of outdoor trampolines and fitness rebounders. So, are they a good choice for you and your family? 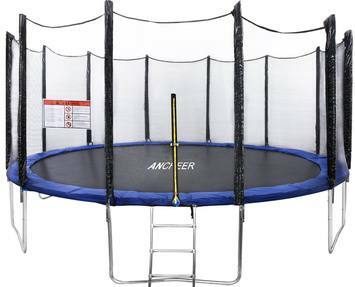 Read on for our Ancheer trampoline review. How is Ancheer trampoline assembly? How does Ancheer compare to other brands? 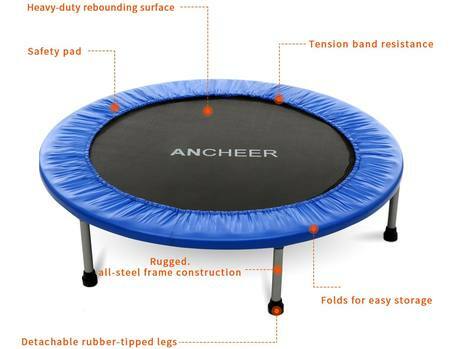 Where do I find an Ancheer trampoline for sale? Galvanised steel frame: This is a very durable and rust-resistant material. Therefore, the trampoline should be able to withstand years of heavy use even in adverse weather conditions. Rust-resistant springs: These are designed to resist rusting even in heavy rain. ​Safety enclosure: Especially if kids are using it, there is a strong possibility that your trampoline will see quite a bit of wild bouncing. Therefore, it's really important to have a safety enclosure to prevent anyone falling off. ​Dual-entry system: This model uses both a zip and a latch to keep the enclosure shut. This is a great feature as it prevents anyone falling from the entrance during use. ​Foam pad: There is a thick layer of foam padding around the edge of the frame where the springs are located. This protects against and trips or bumps. Also, it prevents arms and legs from falling down the gap where the springs are, which can be dangerous. Quick assembly: Ancheer say that these trampolines can be assembled in around an hour. W-shaped legs: These legs are great for safety because they make the trampoline more stable. Also, they prevent the trampoline shifting position during use. Available in two sizes: This rebounder is available in the sizes 38" and 40". Choice of foldability: If you don't want to be able to take your rebounder around with you or pack it away into a small space, the non-folding option will be fine for you. However, if you want a portable rebounder, both sizes are available with a folding design. This only costs a few extra dollars. 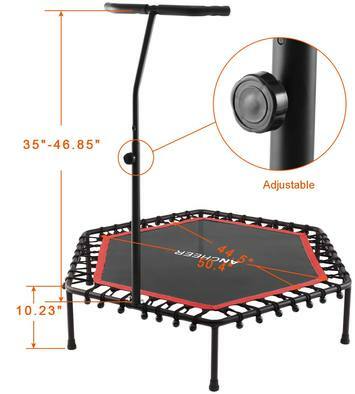 ​Rubber-tipped legs: This prevents the trampoline from moving during use and protects your floors from damage. Foam padding: The springs are covered by a thick foam pad. This protects from knocks and bumps. Furthermore, it stops your feet from falling down the gaps where the springs are, which can be dangerous. 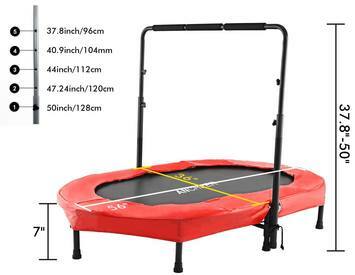 This is another trampoline designed for rebounder training, measuring 50". It is a little more expensive than the previous option, but does have some extra features. Check latest prices here. Hexagonal shape: This provides a larger bouncing surface than the usual round shape of most rebounders. Bungees: Bungees provide a much quieter and lower-impact bounce than springs. ​Stability bar: This is a great safety feature and is especially suitable for seniors or those with balance issues. Rubber-tipped legs: Again, these help to keep your trampoline stable, and protect your floor from unsightly scratches. Heavy-duty construction: The frame, handle and jumping mat are designed to withstand heavy and enthusiastic use. Safety bar: This helps to prevent your kids from bouncing off the trampoline and hurting themselves. Also, it has 5 different adjustable heights. This means you can change the height as your kids grow. Oval shape: This provides a larger surface area to the jumping mat, giving more space for bouncy fun! Overall, customer reviews of all the Ancheer products is pretty positive. Most importantly, many users comment that the trampolines are sturdy and durable. Also, as they are relatively affordable in comparison to other brands, this means that customers are getting good value for money. However, there are some negative reviews, most of which relate to difficult assembly. Ancheer claim that their trampolines are very quick to assemble. However, many customer reviews report that the trampolines are difficult and frustrating to put together. Therefore, it's a good idea to consult the video guides which Ancheer make available to their customers. Ancheer provide a wider range of products than many other manufacturers, and their products are towards the more affordable end of the market. However, they have customer reviews to rival many of the more expensive brands. It is worth bearing in mind that some other brands are much easier to assemble than the Ancheer products. The 15ft model will support a weight of 375lbs. The other outdoor models accommodate 330lbs. The fitness rebounders and kids' model with handle all support 220lbs. Apart from replacement springs, we were unable to find any replacement parts manufactured specifically for Ancheer trampolines. Please check your manual carefully before you use generic replacements, or they may not fit and provide acceptable safety. We love the reasonable pricing of Ancheer trampolines, especially as you get a high-quality product for your money. Also, we are impressed by the range of products they have available. This means you should be able to find a model that suits your requirements. Unfortunately, it sounds like the products are pretty tricky to put together. Also, it would be great to see Ancheer selling a range of replacement parts so that customers can repair their products if necessary. Overall, we feel that Ancheer trampolines are an affordable and high-quality brand that provide excellent value for money. 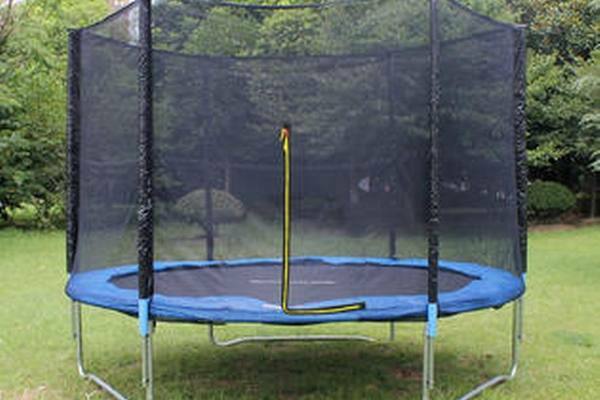 Hopefully, now you've read our Ancheer trampoline review, you'll be well on the way to deciding if this is the best brand for you and your family. Click here to buy on Amazon.